When in doubt bake cookies,yeah.Does not take too much of your time/effort and satisfies your baking itch too.Most importantly,gets done in a jiffy.That's what attracts me most to a cookie.I mean,it is only a matter of few minutes when you can get everything done and get set for a cup of coffee with your just-baked cookies,isn't that wonderful? I've seen this recipe on a lot of blogs and remember writing down the recipe long time back.While I was going through the recipe,I realized it is quite similar to the Cinnamon cookie,only the flavor is different.Without further ado,let me present a very simple[and basic]cookie recipe which can be experimented upon for different flavors.So which one are you gonna try? Mix together the zest and powdered sugar with your finger tips till the sugar becomes moist and fragrant. Mix all the ingredients to a smooth dough and keep aside for 20 minutes. Roll the dough into ¼ inch thickness and cut into desired shapes-OR shape them into small balls and flatten them a little between your palms. 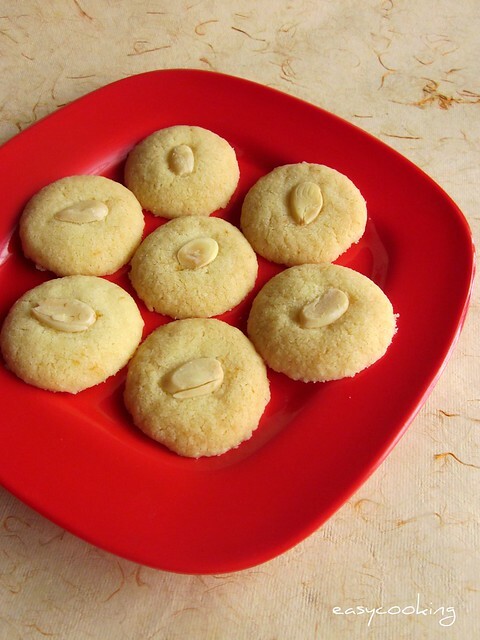 Press an almond sliver on top. Place the cookies on a lightly greased cookie tray. Bake in a preheated oven at 180C for 15 minutes. The cookies spread out while baking so make sure you keep a good one inch distance between each cookie. The lime flavor is not a dominating one,in fact there is a very faint taste of lime which gets even better the next day. Love the flavor of the lemon in the cookies. Lime and almond in a cookie is a flavor combo I have never tried before, sounds good! Similar to the basic egg less cookie dough I guess? they look wonderful..love citrusy flavoured bakes.. want to try lemon cake one of these days.. Loved the flavour and the color. I bake cookies because I'm a self confessed cookie monster :) I love such hassle free cookie recipes. The cookies have come out perfect. They are looking pretty cute in that red serving plate. Yum yum yummy cookies Divya. 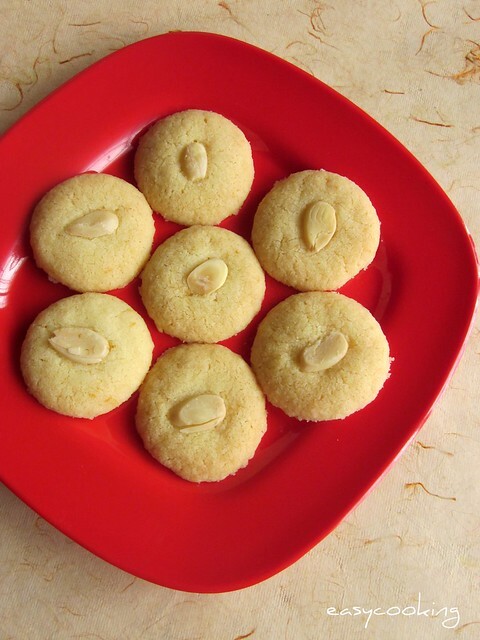 Scrumptious and gorgeous cookies, love citrus flavour in bakes..
You are so right ,cookies are the best way to get rid of 'Cooking Itch'. Can't we enhance lemon flavor by adding few drops of lemon essence? These cookies are so tempting. Do u hav microplane zester?- Rajasree from bangalore. Rinku..I just rolled the cookie dough into small balls and flattened them a bit[which ends up in a round shape].You could try refrigerating the cookies on the tray[before baking] while you preheat the oven[for 5-10 minutes]and bake the cookies,which would not cause them to spread out and spoil the shape! Suma..this is a basic cookie dough in which you can add any flavorings of your choice.Lime,Cinnamon,Cardamom or ground ginger even,choices are numerous! Abha..adding lemon essence is a good idea! Rajasree..yes,I do have a Microplane Zester! Should be very flavorful with lemon zest,looks perfect and love the pictorial! I had tried them a few months back from AA Book. I loved it.. looks like its time I bake them again..